The abolition of monarchy involves the ending of monarchical elements in the government of a country. Such abolition may also (but not always) eliminate aristocratic systems[note 1] and "hereditary government"[note 2] features in constitutional practice. History records transitions from monarchy to other forms of government from very early times, either through revolutions, coups d'état, wars, or legislative reforms (sometimes involving abdications). Athens had abandoned the principle of hereditary rule by 753 BCE. The founding of the Roman Republic in the 6th century BCE provides a well-known example and anti-monarchism became part of Rome's traditions, being cited as justification for the assassination of Julius Caesar in 44 BCE. Monarchical Carthage became an aristocratic republic in 308 BCE. An early example of the abolition of a monarchy in modern times occurred in 1649 with the overthrow of the English monarchy by the Parliament of England and its armed forces under leaders such as Oliver Cromwell. 1660 saw a monarchical restoration - though in a more limited form moderated by a more independent Parliament. Organized Anti-monarchism in what since July 1776 is the United States developed out of the gradual process of revolution that began in 1765, as colonists resisted the Stamp Act through boycott and the expulsion and condemnation of royal officials. While subjects of Great Britain (a union of the Kingdom of England with the Kingdom of Scotland), the colonists of British North America enjoyed a level of autonomy which increasingly clashed with royal and Parliamentary authority which did not consult colonial needs. With the Declaration of Independence in 1776, the most violent wave of anti-monarchical protest began, with the systematic destruction of the relics and symbols of monarchy. Examples can be found in the toppling of the equestrian statue of George III on Bowling Green in New York City (9 July 1776). Monarchic loyalists were particularly affected by partisan attacks or harassment, with tens of thousands leaving for Canada, Britain, and other colonies. Wealth or property which remained was typically confiscated. [by whom?] Thomas Paine, the famous author of the revolutionary pamphlet "Common Sense", urged the colonists to finance the revolutionary war through this means. Even today, very few artifacts depicting the British monarchy from the colonial period can be found in the United States. However, not all anti-British or anti-Loyalist sentiment equated to anti-monarchism. The normalcy of having a King at the head of a polity had strong roots in much political thought (Machiavelli, Hobbes) and in religious doctrine (see for example 1 Samuel 8:6-9. Some Americans saw the presidency in monarchical terms. However, the most famous abolition of monarchy in history - apart from the Dutch Republic of 1581 to 1795 - involved the French monarchy in 1792, during the French Revolution. The French monarchy was later restored several times with differing levels of authority. Napoleon, initially a hero of the Republican revolution, crowned himself emperor in 1804 only to be replaced by the Bourbon Restoration in 1815 which in turn was replaced by the more liberal July Monarchy in 1830. The 1848 Revolution was a more clear anti-monarchic uprising that replaced the succession of royal leaders with the short-lived Second French Republic. Louis Napoleon Bonaparte established the Second French Empire (1852 to 1870), retaining republican aspects while placing himself in the center of the state until the losses in the Franco-Prussian War precipitated his fall, resulting in the French Third Republic and the definitive end of monarchism in the governing of France. In 1858 the Mughal Empire came to an end after losing a war against Britain, and its Emperor, Bahadur Shah II, lost his throne. Between 1859 and 1861, four monarchies in Southern Europe ceased to exist: Parma, Modena, Tuscany and the Two Sicilies, when they all became part of the new Kingdom of Italy. The Second Mexican Empire collapsed in 1867, and its Emperor, Maximilian I of Mexico, was executed. The Second French Empire came to an end in 1870 after it had lost the war against Prussia, causing Emperor Napoleon III to lose his throne. He was the last monarch of France. In Spain monarchy was abolished from 1873 to 1874 by the First Spanish Republic, but then restored until 1931. The monarchy of Tahiti came to an end in 1880 when France made it a colony and overthrew King Pōmare V. That of Burma was abolished in 1885, when the last king, Thibaw Min, lost his throne and the country was annexed by Britain. In Brazil, the monarchy was abolished in 1889, when Emperor Pedro II was overthrown by a republican military coup (the status of the republic was fully confirmed by a plebiscite in 1993 that resulted in 66% of the votes to the republican government). In 1893 foreign business leaders overthrew Queen Liliʻuokalani of the Kingdom of Hawaii. They established a republic, which was annexed by the United States in 1898. The monarchy of Madagascar, known as the Merina Kingdom, came to an end in 1897 when France made it a colony and overthrew Queen Ranavalona III. In 1910 the last emperor of Korea, Sunjong, lost his throne when the country was annexed by Japan. However, the Korean royal family was mediatised as a puppet family within the Japanese imperial family. Many of the Korean royals were forcibly re-educated in Japan and forced to marry Japanese royalty and aristocrats to meld the ruling families of the two empires. With the abolition of the Japanese aristocracy and cadet branches of the imperial family, the Korean royals officially lost their remaining status. The monarchy of Portugal was also overthrown in 1910 (5 October), two years after the assassination of King Carlos I, ending the reign of Manuel II, who died in exile in England (1932), without issue. The ancient monarchy of China ceased to exist in 1912 after the revolution of Sun Yat-sen overthrew Emperor Puyi. General Yuan Shikai, then provisional president, unsuccessfully tried to make himself a monarch in 1915. World War I led to perhaps the greatest spate of abolition of monarchies in history. The conditions inside Russia and the poor performance in the war gave rise to a revolution which toppled the entire institution of the monarchy, followed by a second revolution against that government in October of the same year that executed Emperor Nicholas II and implemented a Marxist-Leninist government. The defeated German, Austro-Hungarian and Ottoman empires saw the abolition of their monarchies in the close aftermath of the war, ending the reigns of Wilhelm II, Charles I and Mehmed VI respectively. The monarchs of the constituent states within the German Empire, most importantly Ludwig III of Bavaria, Frederick Augustus III of Saxony and Wilhelm II of Württemberg, soon abdicated. During the war, monarchies were planned for Poland (Kingdom of Poland), the Grand Duchy of Finland (to have a Finnish King), and for Lithuania (Mindaugas II of Lithuania), with a protectorate-like dependency of Germany. Both intended kings renounced their thrones after Germany's defeat in November 1918. King Nicholas I of Montenegro lost his throne when the country became a part of Yugoslavia in 1918. After the death of the last Emperor, Bogd Khan, in 1924, Mongolia became a republic. In Spain the monarchy was again abolished in 1931 by the Second Spanish Republic (1931–1939). 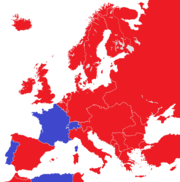 In 1947, General Franco declared Spain a realm, and appointed Juan Carlos of Bourbon his successor in 1969. The Prince of Spain became king at Franco's death in 1975, and constitutional monarchy was restored in 1978 under him. World War II saw another spate of abolitions. In 1939 Italy invaded Albania and removed the reigning self-proclaimed King Zog and instated their own King Victor Emmanuel III as its new monarch. Italy, along with the eastern European monarchies of Bulgaria, Hungary and Romania joined with Germany in World War II against the Kingdom of Yugoslavia, the Western allies and the Soviet Union. As the Axis powers came to a defeat in the war, communist partisans in occupied Yugoslavia and occupied Albania seized power and ended the monarchies. Communists in Bulgaria, Hungary and Romania removed their monarchies with strong backing by the Soviet Union, which had many troops and supporters placed there during the course of the war. Through this, Peter II of Yugoslavia, Simeon II of Bulgaria and Michael I of Romania all lost their thrones. King Victor Emmanuel III of Italy had switched sides during the war in favour of the western allies, but a referendum in 1946 ended the short reign of his son King Umberto II and the Italian monarchy ceased to exist. A unique result of the war was that Emperor Hirohito of Japan, who had held a debated but important role in Japan's warfare against the Allied powers, was reduced in stature from a divine monarch to a figurehead by the occupying United States, instead of losing his throne altogether. Throughout Greece's eventful modern history, the monarchy was toppled and restored several times between and after the two World Wars. The last king, Constantine II, was forced into exile after a coup in 1967 and the republic was proclaimed in 1973 by the then-ruling military dictatorship. Final abolition of the monarchy was confirmed overwhelmingly after constitutional legality was restored, by free referendum in 1974. The independence of the Indian subcontinent from direct British rule in 1947 posed a unique problem. From 1858, when the British government had assumed direct rule over the subcontinent, it had been governed as a quasi-federation, with most of the subcontinent (known as British India), under the direct rule of the British sovereign. The remainder of the subcontinent, however, was under a form of indirect rule through its division and subdivision into over 500 subnational monarchies, known as princely states; each was ruled by a prince in a subsidiary alliance with the British government. The princely states ranged from powerful and largely independent principalities such as Hyderabad or Mysore, with a high level of autonomy, to tiny fiefdoms a few dozen acres in size. The resulting imperial structure was broadly similar to that of the German Empire before the First World War. In 1947, it was agreed the Indian subcontinent would be partitioned into the independent British dominions of India and Pakistan, with the princely states acceding to one nation or the other. The accession process proceeded smoothly, with the notable exception of four of the most influential principalities. The Muslim ruler of the Hindu-majority state of Junagadh ruler acceded to Pakistan, but his decision was overruled by the Indian government, while Hyderabad chose to be independent, but was forcibly annexed to India in 1948. The Hindu ruler of Jammu and Kashmir, among the largest and most powerful of the principalities, but with a Muslim-majority population, initially held off on a decision. In the autumn of 1947, an invading force from Pakistan frightened the ruler into acceding to India. The ruler of Kalat, in Baluchistan, declared his independence in 1947, after which the state was forcibly merged with Pakistan, resulting in an insurgency persisting to this day. With the promulgation of the Indian constitution in 1950, India abolished its monarchy under the British crown and became a republic within the Commonwealth of Nations, followed by Pakistan in 1956; as a result of both developments, the majority of the princes formally lost their sovereign rights. A few remaining principalities in Pakistan retained their autonomy until 1969, when they finally acceded to Pakistan. The Indian government formally derecognised its princely families in 1971, followed by Pakistan in 1972. Many monarchies were abolished in the middle of the 20th century or later as part of the process of decolonisation. The monarchies of India, Ghana, Nigeria, Kenya, Tanganyika, Uganda, Guyana, and Malawi were abolished shortly after they became independent of the United Kingdom, while remaining within the Commonwealth. That of Ireland was not abolished when Ireland became independent of the United Kingdom in the 1920s, but by the Republic of Ireland Act of 1948, which came into force in 1949. Some Commonwealth realms waited a little longer before abolishing their monarchies: Pakistan became a republic in 1956 and South Africa in 1961. Gambia abolished its monarchy in 1970, while Sierra Leone became a republic in 1971, as did Sri Lanka in 1972, Malta in 1974, Trinidad and Tobago in 1976, and Fiji in 1987. The latest country to become a republic within the Commonwealth was Mauritius in 1992. That of Egypt was abolished in 1953, after the revolution of 1952, which caused King Farouk I to abdicate in favour of his infant son Fuad II. The monarchy of Tunisia ended in 1957 when Muhammad VIII al-Amin lost his throne and that of Iraq in 1958 when King Faisal II was killed and a republic proclaimed. The monarchy of Yemen was abolished in 1962 when King Muhammad al-Shami was overthrown in a coup, although he continued to resist his opponents until 1970. King Idris of Libya was overthrown by a military coup led by Muammar Gaddafi in 1969. The monarchy of Afghanistan was abolished in 1973 after a coup d'état overthrew King Mohammed Zahir Shah. That of Iran was abolished by the Islamic revolution of 1979 overthrowing Mohammad Reza Pahlavi. In Ethiopia, Emperor Haile Selassie I was overthrown in 1974 as a result of a leftist coup. King Palden Thondup Namgyal of Sikkim lost his throne in 1975 when the country became a state of India following a referendum. Political upheaval and Communist insurrection put an end to the monarchies of Indochina after World War II: a short-lived attempt to leave a monarchical form of government in post-colonial South Vietnam came to naught in 1955, a military coup overthrew the kingless monarchy in Cambodia in 1970 and a Communist takeover ended the monarchy in Laos in 1975. Cambodia's monarchy later saw an unexpected rebirth under an internationally mediated peace settlement with former king Norodom Sihanouk being restored as a figurehead in 1993. In a referendum in Brazil in 1993, voters rejected an attempt to restore the country's monarchy. Unsuccessful efforts to restore the monarchies of some of the Balkan states in the former Eastern Bloc continue. Former King Michael of Romania and Prince Alexander of Serbia have been allowed to return, gained some popularity, played largely apolitical public roles, but never came close to being restored to their ancestral thrones. However, in Bulgaria, Simeon Saxe-Coburg-Gotha, who was deposed from the Bulgarian throne in 1946, was elected and recently served as the Prime Minister of his country from 2001 to 2005. The only formerly socialist country to have held a referendum on the monarchy was Albania where the claimant to his father's throne, the self-styled Leka I, lost by a huge margin. In a 1999 referendum, the voters of Australia rejected a proposal to abolish their monarchy in favour of a specific republican model. The proposal was rejected in all states, with only the Australian Capital Territory voting in favour. Dendi Askia Malla 1901 Ousted by the French, the country became a part of French West Africa. Ashanti Prempeh I 1902 Ousted by the British, the country became a part of Gold Coast (British colony). Oyo Adeyemi I Alowolodu 1905 Last monarch died, the country became a part of British Southern Nigeria Protectorate. Mwali 1909 The country was incorporated into French Third Republic. Portugal Manuel II 1910 Republican Coup d'État. Korea Sunjong Native monarchy abolished; replaced by rule by Japan, a monarchy, through 1945. Angoche Ousted by the Portuguese, the country was incorporated into Portugal. Nri Eze Nri Òbalíke 1911 Ousted by the British, the country became a part of Southern Nigeria Protectorate. Kasanje The country was incorporated into Portuguese West Africa. China Xuantong 1912 Xinhai Revolution – Emperor ousted by warlords and republicans. Ndzuwani Saidi Mohamed bin Saidi Omar The country was incorporated into French Third Republic. Kongo Manuel III 1914 Position abolished by Portuguese after an unsuccessful revolt. Sultanate of Sulu Sultan Jamalul-Kiram II 1915 Split into American Insular Government over the Philippine islands, British North Borneo and the Dutch East Indies. Darfur Ali Dinar 1916 Darfur formally re-incorporated into Anglo-Egyptian Sudan. China Hongxian Monarchy dropped, shortly after the outbreak of the National Protection War. Russia Nicholas II 1917 Russian Revolution of 1917. Finland Finnish Declaration of Independence. Montenegro Nicholas I 1918 Referendum deposed King and united Montenegro with Serbia. Germany William II All on account of German defeat in World War I and the following German Revolution. Austria Charles I Charles I "renounced participation" in state affairs, but did not abdicate. Monarchy officially abolished by the Treaty of Saint-Germain-en-Laye, on 10 September 1919. Finland Frederick Charles I Monarchy never in effect. Hungary Charles IV Monarchy restored in 1920, although the throne remained vacant with a Regent. Serbia Peter I Country transformed to Kingdom of Serbs, Croats and Slovenes. Ukraine Pavlo Skoropadskyi Removed from power, following an uprising led by Symon Petliura and the withdrawal of German forces from Kiev. Bukhara (Uzbekistan) Mohammed Alim Khan 1920 Monarchy deposed by an invasion by the Red Army (Bukhara operation (1920)). Khiva (Uzbekistan) Abdallah Khan Monarchy deposed by a communist uprising aided by the Red Army (Khivan Revolution). Syria Faisal I Monarchy deposed, following the Siege of Damascus. Ottoman Empire Mehmed VI 1922 Sultanate abolished in 1922. Wituland Fumo `Umar ibn Ahmad 1923 Sultanate abolished by British, the country was incorporated into Kenya Colony. Greece George II 1924 Restored 1935 and later abolished again in 1973 (see below). Mongolia Bogd Khan Communist People's Republic proclaimed after Khan's death. Albania William I 1925 Monarchy restored in 1928 (Albanian Kingdom). Orungu Rogombé-Nwèntchandi 1927 Position abolished by French. Spain Alfonso XIII 1931 Later restored (see below). Jimma Abba Jofir 1932 Ousted by Ethiopians, Jimma incorporated into Ethiopia. Albania Zog I 1939 Throne usurped by Victor Emmanuel III, after Italian invasion. Albania Victor Emmanuel III 1943 Relinquished throne after Italian armistice. Croatia Tomislav II Abdicated after withdrawal of Italian support. Iceland Christian X 1944 Union with Denmark terminated. Yugoslavia Peter II 1945 Communist reconstruction. Manchukuo Kāngdé Merged into the Republic of China after abolition of the Empire. Vietnam Bảo Đại Monarchy abolished after the Surrender of Japan. Hungary Miklós Horthy as Regent 1946 Decision of the parliament without a referendum. Italy Umberto II Referendum; official result: 54.3% in favour of republic. Bulgaria Simeon II Referendum held to decide whether the monarchy would be retained; 95% in favour of republic. Simeon later served as Prime Minister of Bulgaria 2001-2005. Sarawak Charles Vyner Brooke White Rajahs hand over power to British crown. Romania Michael I 1947 Forced out by the communists. Ireland George VI 1949 Abolished the last "Monarchy of Ireland", the King of the United Kingdom. India George VI 1950 Abolished Commonwealth monarchy. Tibet Tenzin Gyatso 1951 Incorporated into the People's Republic of China. Egypt Fuad II 1953 Republic proclaimed one year after the 1952 Revolution. Vietnam Bảo Đại 1954 Vietnam partitioned through the Geneva Accords. Vietnam Bảo Đại 1955 Referendum in South Vietnam. Pakistan Elizabeth II 1956 Abolished Commonwealth monarchy. Ghana Elizabeth II 1960 Abolished Commonwealth monarchy, following a referendum; official result: 88% in favour of republic. South Africa 1961 Abolished Commonwealth monarchy pursuant to 1960 referendum; official result: 53% in favor of republic. Rwanda Kigeli V coup d'état, followed by referendum; official result: 80% in favor of abolishing monarchy. Tanganyika Elizabeth II 1962 Abolished Commonwealth monarchy. Nigeria Elizabeth II 1963 Abolished Commonwealth monarchy. Malawi Elizabeth II Abolished Commonwealth monarchy. Fadhli Sultanate Nasser bin Abdullah bin Hussein bin Ahmed Alfadhli 1967 The countries were incorporated into newly created People's Republic of South Yemen. Maldives Muhammad Fareed Didi 1968 Independence referendum. Rhodesia Elizabeth II 1970 Abolished Commonwealth monarchy. An unrecognised government of the British colony of Southern Rhodesia had unilaterally declared independence as Rhodesia in 1965, proclaiming Elizabeth II as Queen, but she did not accept the title, nor was it recognised by any other state. Following a referendum in 1969, in which 81% voted to abolish the monarchy, a republic was declared in 1970. Cambodia Norodom Sihanouk Later restored (see below). The Gambia Elizabeth II 1971 Abolished Commonwealth monarchy. Ceylon 1972 Abolished Commonwealth monarchy, state name changed into "Sri Lanka". Afghanistan Mohammed Zahir Shah 1973 coup d'état. Malta Elizabeth II Abolished Commonwealth monarchy. Sikkim Palden Thondup Namgyal Referendum; official result: 97% to become a state of India. Trinidad and Tobago Elizabeth II 1976 Abolished Commonwealth monarchy. Rwenzururu Charles Mumbere 1982 Forced to abdicate by the government of Uganda; declaration of independence of Rwenzururu was annulled. Fiji Elizabeth II 1987 Abolished Commonwealth monarchy. Elizabeth II remained recognized as Paramount Chief by the Great Council of Chiefs until the council's de-establishment on 14 March 2012. Mauritius Elizabeth II 1992 Abolished Commonwealth monarchy. Nepal King Gyanendra 2008 Monarchy abolished on 28 May 2008, replaced with a secular federal republic. ^ Aristotle in his Politics distinguished monarchy and aristocracy as systems of government. Note that Russia after 1917, for example, abandoned traditional nobility; German nobility (but not Austrian nobility) after 1919 retained certain features of aristocratic nomenclature and social influence. ^ Not all monarchies depend on the inheritance of political power: see elective monarchy. ^ The Ottoman Empire and Russian Empire are counted amongst Europe, the German Empire is counted as a single monarchy. ^ The Republic of Turkey is counted amongst Europe, the Union of Socialist Soviet Republics as a single republic, the Irish Free State as an independent monarchy (see also Irish head of state from 1936 to 1949), Vatican City as an elective monarchy, the Kingdom of Hungary as a nominal monarchy. ^ Maya Jasanoff (2012). Liberty's Exiles: American Loyalists in the Revolutionary World. Random House. p. 357. ^ "But the thing displeased Samuel, when they said, Give us a king to judge us. And Samuel prayed unto the LORD. And the LORD said unto Samuel, Hearken unto the voice of the people in all that they say unto thee [...]. Now therefore hearken unto their voice: howbeit yet protest solemnly unto them, and shew them the manner of the king that shall reign over them." ^ Note for example: Breen, Timothy H. (2017). "4: Voices of the People". George Washington's Journey: The President Forges a New Nation. New York: Simon and Schuster. p. 120. ISBN 9781451675436. Retrieved 24 February 2017. If most Americans saw the danger of addressing Washington as their American Caesar - he had absolutely no interest in becoming emperor - they nevertheless found it surprisingly appealing to depict him as a king, as in King George I of the United States. Their extremely unrepublican behavior when they encountered him on the road probably drew on their recent colonial past. While Americans had just ratified a republican form of government, which among other things abolished monarchs and aristocrats, many of them almost reflexively imagined Washington as a kind of elected monarch. ^ "World | South Asia | Nepal votes to abolish monarchy". BBC News. 28 May 2008. Retrieved 21 July 2011.